To hold Movie genres we need a lookup table. For Kind field we used an enumeration but this time genres might not be that static to declare them as an enumeration. As usual, we start with a migration. We also added a GenreId field to Movie table. Actually a movie can have multiple genres so we should keep it in a separate MovieGenres table. But for now, we think it as single. We&apos;ll see how to change it to multiple later. Use parameters shown with dotnet sergen g if you are using ASP.NET Core version. As you see in screenshot, it is generated under a new section MovieDB instead of the one we renamed recently: Movie Database. This is because Sergen has no idea of what customizations we performed on our Movie page. So we need to movie it under Movie Database manually. Now let&apos;s add some sample genres. I&apos;ll do it through migration, to not to repeat it in another PC, but you might want to add them manually through Genre page. As we did with Kind field before, GenreId field needs to be mapped in MovieRow.cs. Here we mapped GenreId field and also declared that it has a foreign key relation to GenreId field in [mov].Genre table using ForeignKey attribute. If we did generate code for Movie table after we added this Genre table, Sergen would understand this relation by checking foreign key definition at database level, and generate similar code for us. We also added another field, GenreName that is not actually a field in Movie table, but in Genre table. Serenity entities are more like SQL views. You can bring in fields from other tables with joins. 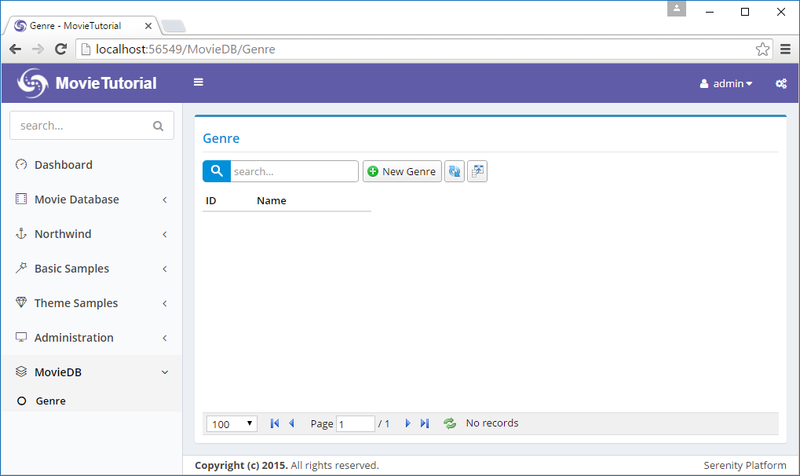 By adding LeftJoin("g") attribute to MovieId property, we declared that whenever Genre table needs to be joined to, its alias will be g.
This join will only be performed if a field from Genre table requested to be selected, e.g. its column is visible in a data grid. By adding Expression("g.Name") on top of GenreName property, we specified that this field has an SQL expression of g.Name, thus it is a view field originating from our g join. Now if we build and run application, we&apos;ll see that a Genre field is added to our form. The problem is, it accepts data entry as an integer. We want it to use a dropdown. It&apos;s clear that we need to change editor type for GenreId field. To show an editor for Genre field, list of genres in our database should be available at client side. For enumeration values, it was simple, we just run T4 templates, and they copied enum declaration to script side. Here we can&apos;t do the same. 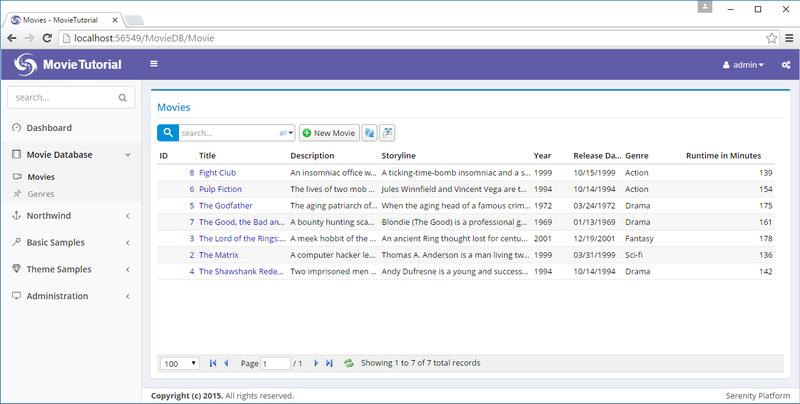 Genre list is a database based dynamic list. Serenity has notion of dynamic scripts to make dynamic data available to script side in the form of runtime generated scripts. The dynamic here corresponds to the data they contain, not their behavior. Unlike web services, dynamic scripts can&apos;t accept any parameters. And their data is shared among all users of your site. They are like singletons or static variables. You shouldn&apos;t try to write a dynamic script (e.g. lookup) that acts like a web service. We just added line with [LookupScript("MovieDB.Genre")]. Rebuild your project, launch it, after logging in, open developer console by F12. This step was just to show how to check if a lookup script is available client side. Lookup key, "MovieDB.Genre" is case sensitive. Make sure you type exact same case everywhere. There are two places to set editor type for GenreId field. One is MovieForm.cs, other is MovieRow.cs. I usually prefer the latter, as it is the central place, but you may choose to set it on a form, if that editor type is specific to that form only. Information defined on a form can&apos;t be reused. For example, grids use information in XYZColumn.cs / XYZRow.cs while dialogs use information in XYZForm.cs / XYZRow.cs. So it&apos;s usually better to define things in XYZRow.cs. After we build and launch our project, we&apos;ll now have a searchable dropdown (Select2.js) on our Genre field. Server Error in &apos;/&apos; Application. [LookupScript] attribute, so it can&apos;t be used with a LookupEditor! Forms are scanned at application startup, so there is no way to handle this error without fixing the issue. 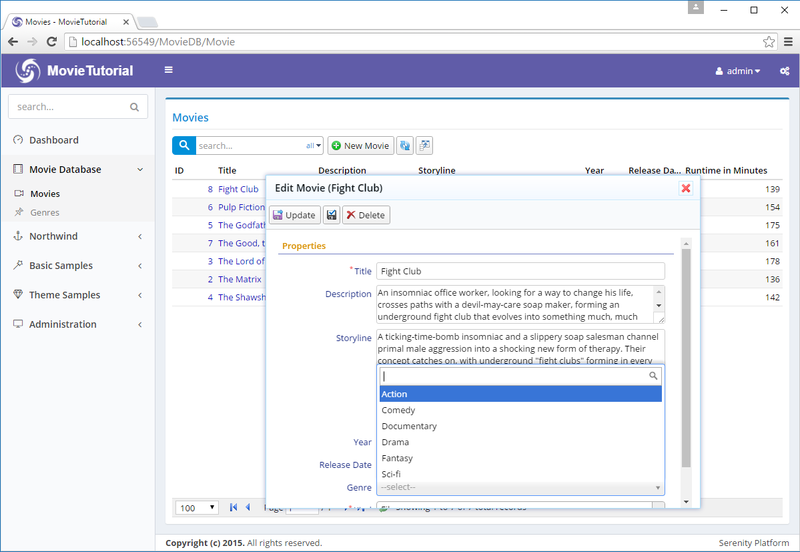 Currently, movie genre can be edited in the form but is not displayed in Movie grid. Edit MovieColumns.cs to show GenreName (not GenreId). Now GenreName is shown in the grid. While setting genre for our sample movies, we notice that The Good, the Bad and the Ugly is Western but there is no such genre in Genre dropdown yet (so I had to choose Drama). Fortunately, Serenity has integrated inplace item definition ability for lookup editors. Now we can define a new Genre by clicking star/pen icon next to genre field. Here we also see that we can use a dialog from another page (GenreDialog) in the movies page. In Serenity applications, all client side objects (dialogs, grids, editors, formatters etc.) are self-contained reusable components (widgets) that are not bound to any page. 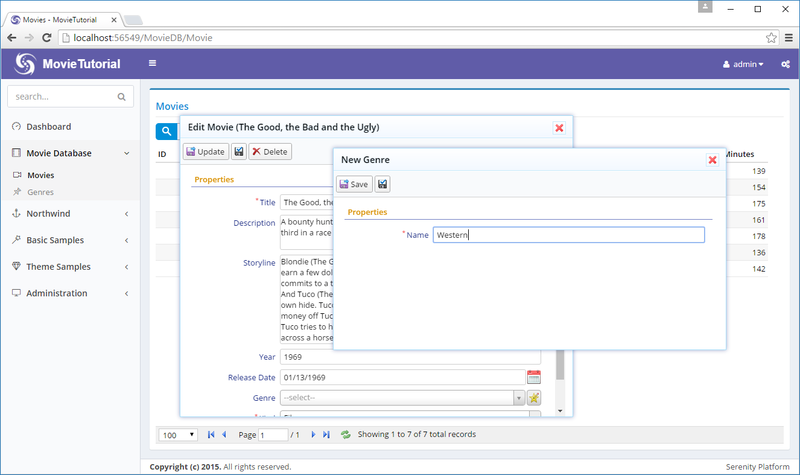 It is also possible to start typing in genre editor, and it will provide you with an option to add a new genre. You probably didn&apos;t notice this detail. Our lookup editor for genre selection, automatically opened a new GenreDialog when you wanted to add a new genre inplace. 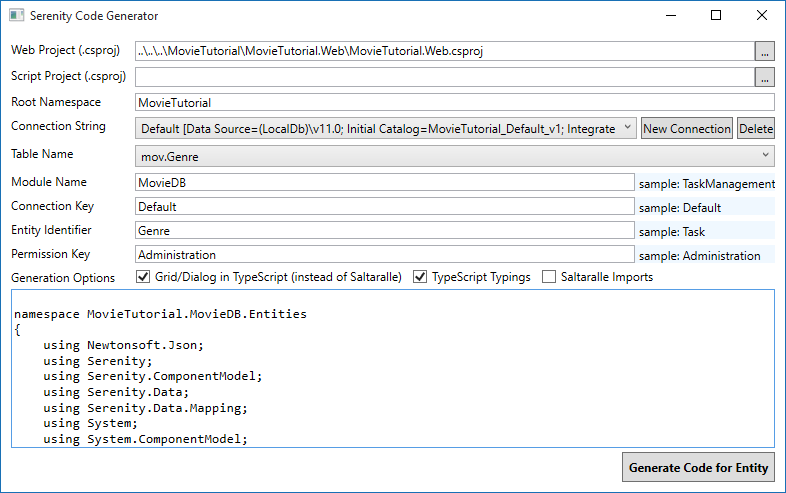 Luckily, we have a GenreDialog, which is defined in Modules/Genre/GenreDialog.ts and its full name is MovieTutorial.MovieDB.GenreDialog. Uncaught MovieDB.GenreDialog dialog class is not found! You shouldn&apos;t specify Dialog suffix, nor the full namespace, e.g. 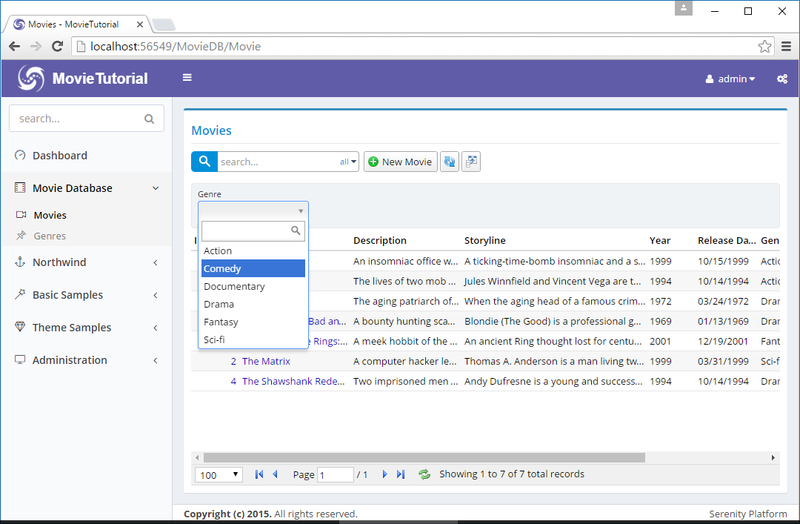 MovieTutorial.MovieDB.Genre, as Serenity automatically searches for them. As our list of movies becomes larger, we might need to filter movies based on values of some fields, besides the quick search functionality. Serenity has several filtering methods. One of them is Quick Filter, which we&apos;ll use on Genre field. The field that is filtered is actually GenreId not GenreName that we attached this attribute to. Serenity is clever enough to understand this relation, and determined editor type to use by looking at attributes of GenreId property in GenreRow.cs. As we added a new entity to our application, we should run T4 templates after building solution.